Thieves held up a GameStop at gunpoint and made away with all of the money in the till, as well as over 100 copies of Call of Duty: Black Ops. 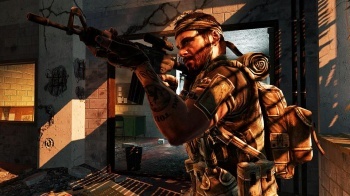 Savvy thieves in Bel Air, Maryland must have figured out that in order for a big-ticket videogame like Activision's Call of Duty: Black Ops to go on sale tomorrow that most retailers would have a few cases already this weekend. So when they strode into the GameStop Saturday wielding semi-automatic handguns, not only did they steal whatever cash was there and a bunch of game systems, the thieves made out with four cases of Black Ops which translates to over a hundred copies of the game. Monica Worrell, spokesperson for the Harford County Sheriff's office, said that they are on the lookout for anyone trying to sell copies of the game early and asked people in the area to contact the police if they are approached, possibly from a windowless white van in the parking lot. "Call of Duty: Black Ops isn't out there 'til Tuesday, so anybody that has it today or tomorrow shouldn't have it," Worrell said on Sunday. This is the second GameStop in Harford county to be robbed in the last three weeks. The first incident took place at a store in Aberdeen on October 21st, and the authorities think that the two crimes might be linked. The robbers escaped the Bel Air GameStop in a white van, possibly a Dodge Caravan, and witnesses in Aberdeen reported seeing a white van when the robbery took place there. It's not much to go on, but we may be seeing a rash of GameStop capers hitting the nation. News at eleven!